Mine firearms season started bad. Repaired my platform (in a tree) A couple weeks before firearms season. Have been hunting out of that tree for nearly 20 years. Opening morning I walked up to my tree in the dark. Nearly ran into my platform on the ground. The root ball gave up and the tree fell over. So I propped up against a tree on the ground. That morning seen 11 doe/button bucks. Afternoon was quiet until 1/2 hour before sunset. A basket rack 8 eased through chewing on beans. Knowing how my luck has been the last few years, I shot him. Only seen 3 more deer the rest of firearms season. 2 little button bucks walked up to me. I giggled they took off. Then another basket rack walked by at 15 yards. He was just idling walking around. Not seen another doe. Not been out for muzzle loader season. Caught a chest cold and not able to shake it as of yet. Hopefully can get rid of it for bonus doe firearms kicks back in. Anyhoo, how is your hunt going? 3 deer down. 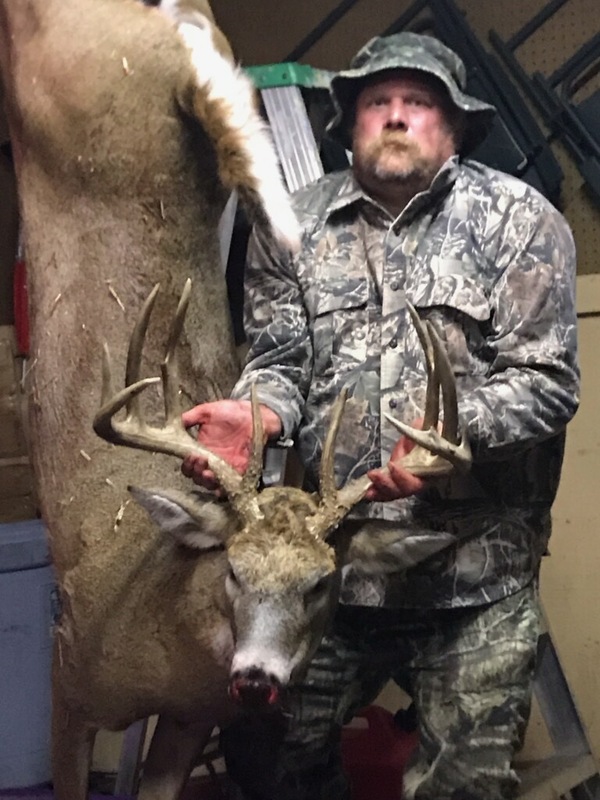 Got my buck opening day with 30-06. Next day got a small doe again with an 06. 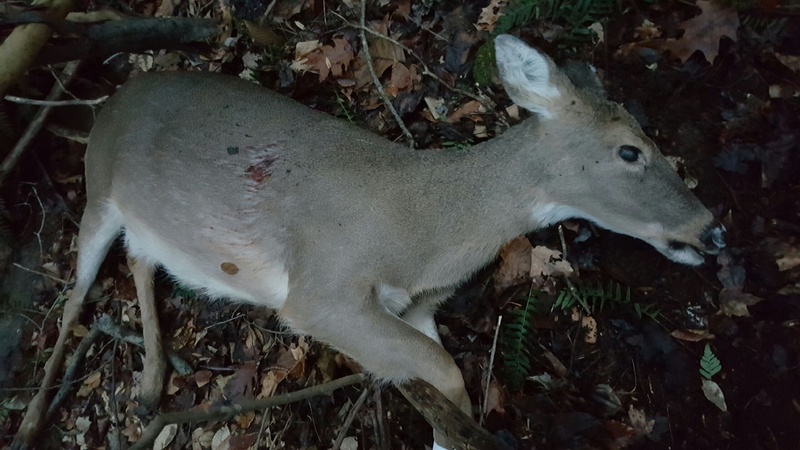 Unfortunately I also wounded a nice mature doe which was the intended target. Did not find that one after several hours of tracking over 2 day period. I finished out my season on opening day of ML. Took a very nice mature doe at about 45 yards with my trusty CVA wolf. Had more opportunities this year than probably since 2011 or 2012. Could have taken a small six, a couple spikes, a button, and a doe in archery. Could have easily shot a decent 8 and some does during gun season. Ended up shooting this doe on the first day of muzzleloader. Well, had an old friend at church that had to be put on oxygen and can no longer hunt. I donated my first deer this year to him and he was tickled that I would think of him and give him a deer. So on close inspection of what I had on hand, I needed to get one to top off our freezer (especially for burger). 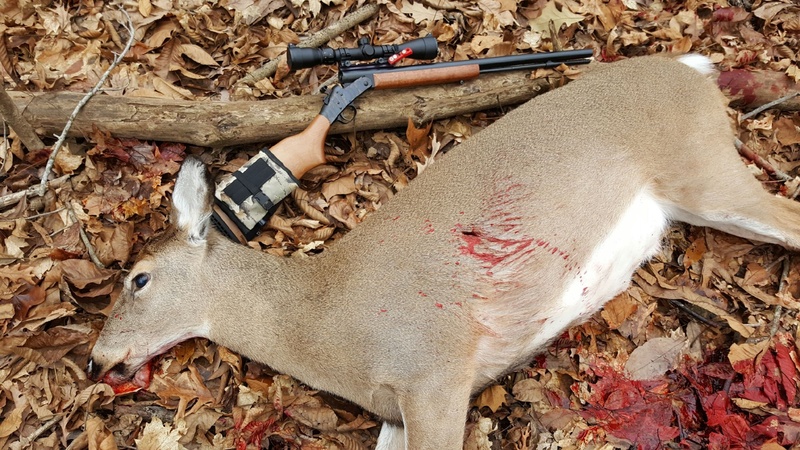 Got lucky on New Year's Day with a Hoosier Nat'l Forest doe. Thank the good Lord for providing!! Shot with an H&R Handi .35 Remington with brass trimmed to just under the 1.8" spec. Loaded with unknown maker 200 grain hollowpoints that I got from Dinny (I am pretty sure). Tried to spine her so that she would drop there on the ridge, but she made it 60-65 yards down into the valley. Bullet passed within an inch of the spine. Guess do to the lower velocity of the .35 Rem that there was not enough shock to do any damage to the nerves. I never got around to chronographing the load, but I was using 41.4 grains of LeverEvolution and the Hornady book has a max of 42.7 grains for the 200 grain bullet class. That load prints just under an inch in my Handi. Good luck to anyone sticking it out the last few days of the season!!! Congrats sir. That sounds like a good season to me. Good for you for helping out a friend. I have not seen any deer when hunting in a while now. I have seen many on my way to work around 03:30. One area I hunt has dogs running trough it constantly. My other area I hunt has had the owners son stomping through since before bow season. Time for a new area. But I still like going out and enjoying the peacefulness of it. 8uck5nort I comment on your post I thought. Sounds like you had a pretty good season congrats. It was a very enjoyable season spent with my Dad. Glad it lasted to the last week; got lots of time with him this year. I had a good season doesn’t deer don’t end of January (I’m lucky in a reduction zone). I got a 13 point 210 pound buck in the third week of October with my crossbow. 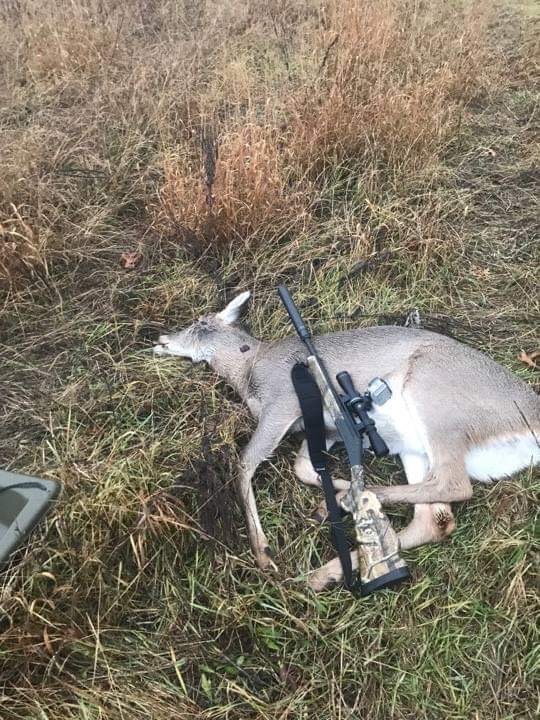 Got a nice doe with my h&r 300 blackout. Still going out looking for my second buck, Passed a 2 1/2 8 point last Friday waiting for a nice one. I have them on camera just waiting for a mistake by one of them. Handi love.Sb2 500 s&w , Sb2 357 max shorty, 223 shorty rifle sights, 35 Whelen rifle sights, 30-06 scope rail, 357 max survivor nickle plated, sb1 44 mag shorty with 20 gauge mod. 12 gauge turkey special, topper 158 30-40 krag and 9mm barrel. Good luck on your bonus buck!! Good looking Blackout! I have one in AR format loaded with 125 Hornady SST at 2215 fps that my daughter packs when she goes with me. We haven't had the opportunity to bring one down with our Blackout yet. If your friend can still walk a little encourage him to keep hunting. I have been on oxygen 365/24/7 for over 10 years and i still deer hunt. I mostly ambush hunt as i can't walk too far. I put an oxygen bottle on my back and off i go. Only real issue is recovery of a deer if i can't drive my truck in to get it. I have found if you have beer and deer sausage it isn't too hard to find someone to drag. Another hunting option for your friend is NWTF Wheeling Sportsmen hunts. These are organized guide hunts with transport to and from hunting blinds. These hunts are for deer and turkey. I have been on several of these hunts and they are a good time. Why be difficult, when with a little extra effort you can be impossible? MINE: 44 Bodeen Belted Magnum PI (Profino Improved), 44 Bodeen Rimmed, 45 Cal Smokeless MZ, 50cal 26" SS Sidekick, 50 cal 26" Huntsman, Tracker II 20 gashorty, 12ga Tracker II shorty WITHOUT scope, 10 gaPardner Smoothbore slug gun, 10ga Pardner Turkey & 24ga Profino Custom rifled slug gun.